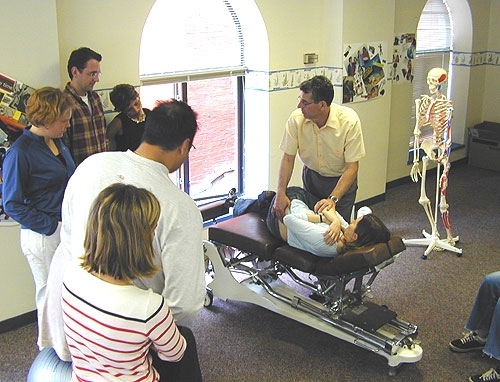 GENTLE "HANDS-ON" MANIPULATION also known as the chiropractic adjustment. The term "adjustment" refers to the gentle hands-on manipulation techniques used to improve the gliding and positioning of misaligned vertebrae. 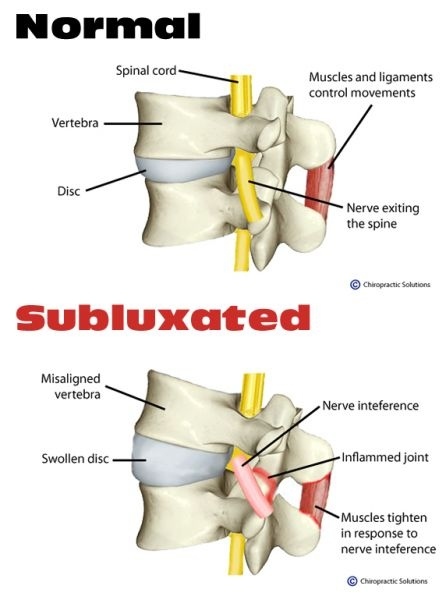 The term "subluxation" describes a vertebrae out of its normal position causing nerve root pressure. The objective of the adjustment is to remove the subluxation and restore normal vertebral gliding. Chronic abnormal gliding of a vertebra results in chronic irritation and inflammation which causes nerve and joint pain as well as osteoarthritis (friction arthritis). The "adjustment" performed by the chiropractor or osteopath re-establishes normal vertebral gliding and positioning. Vertebrae that are locked cause the vertebrae above and below the "lock-up" to overwork. Over-worked vertebrae develop mechanical osteoarthritis, inflammation and nerve root pressure which all create pain. When vertebrae are realigned or adjusted there may be (but not always) an audible "popping" sound. This is caused by the release of oxygen, nitrogen, and carbon dioxide out of the locked joint space. The sensation is typically relieving. There are treatment techniques that create the "popping"sound and other techniques that do not. There are treatment techniques that create the "popping"sound and other techniques that do not. Strains and sprains can also create subluxations. Although subluxation symptoms can be felt right away, they may not reveal themselves for weeks or months. We know that a misaligned vertebrae or locked spinal joint is unhealthy. Left untreated, degenerative changes are almost certain to follow. We never advise a patient to let a misaligned or locked vertebrae heal crooked. Improper or "crooked" healing can result in a lifetime of painful avoidable symptoms including osteoarthritis.